The publication Globalization and its impact on the Quality of Doctoral Education, edited by Maresi Nerad & Barbara Evans, was acknowledged by the AERA Special Interest Group (SIG) Doctoral education across the disciplines with the Outstanding publication Award 2014. The Award Committee was impressed with the scope of the book, which is the outcome of the research-synthesis workshop conducted in Melbourne – 2008 by the Forces and Forms network. The Award Committee acknowledged the contributions of the book in integrating considerations of doctoral education from more than a dozen national contexts and in addressing diverse issues and stakeholders. “The attention to economic, national, and policy concerns across faculty and student perspectives generated thought-provoking material for the reader in response to your guiding question, in this new environment, what constitutes excellence in research doctoral education?”, the recognition says. On the other hand, the nominators highlighted the importance of the book in bringing forth a conversation that includes not only a detailed examination of doctoral education models and metrics and critical questions about the role and purpose of the doctoral education across different nations, which are at various stages of developing their doctoral educational systems. The book explores the question what constitutes excellence of doctoral education in different regions of the globe, and which global forces and local forms inform decisions about what constitutes excellence. 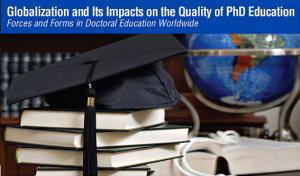 The answer collects the voices of 28 scholars in a dialogue that includes not only a detailed examination of doctoral education models and metrics, but also involves critical questions about the role and purposes of the doctoral degree across nations at different stages of educational system development. What is the Future of Doctoral Education in the 21st Century?